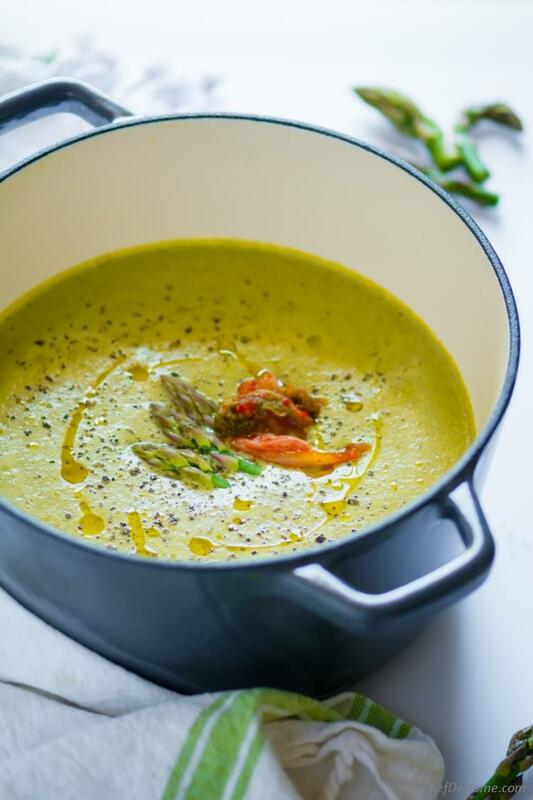 Vegan, gluten free, and creamy fresh Asparagus Soup without creams. Creamy Asparagus Soup with a subtle spicy kick, prepared with fresh asparagus, sweet leeks, spinach and no creams... and Thai-style flavors of fresh ginger, chili, garlic, cilantro, lemon, and coconut milk.. Plus can't beat the tangy-spicy finish with kimchi.. with bonus of gut-friendly pro-biotics. Gluten free, vegan, also Whole30 diet friendly. I must add that this mighty-bowl soup is not just healthy but also filling and PERFECT meal for this season of fresh spring mornings and still cold breezy nights. 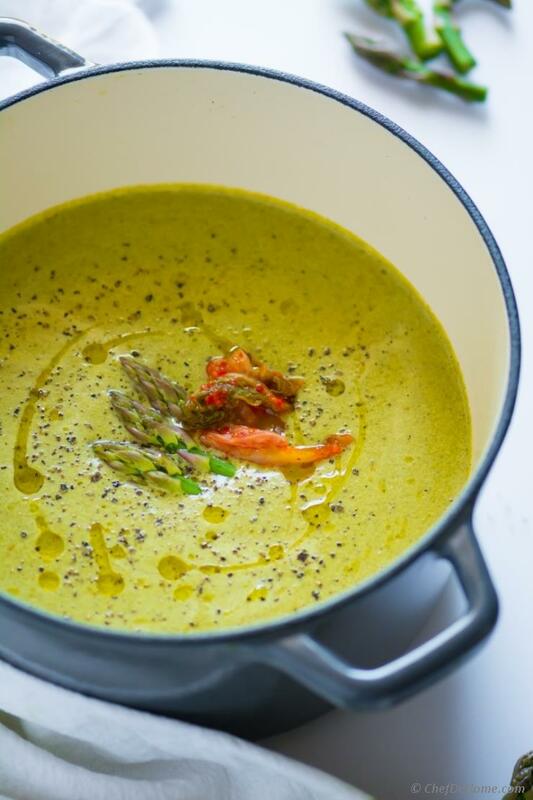 Above all, it is an easy asparagus soup recipe which comes together super fast! Just in 20-25 mins. I call such quick fixes a perfect weekday dinner! 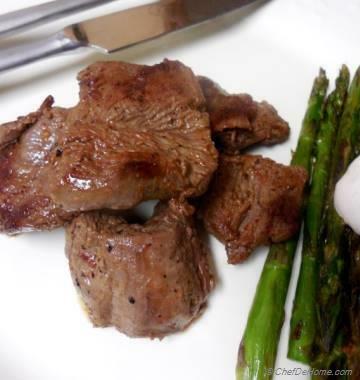 Easy, fast, delicious, and healthy too! Asparagus + vegan + kimchi + Asian ingredients is not first time in my kitchen. This soup is inspired from one my old Pan Sauted Kimchi Asparagus recipe. You guys! 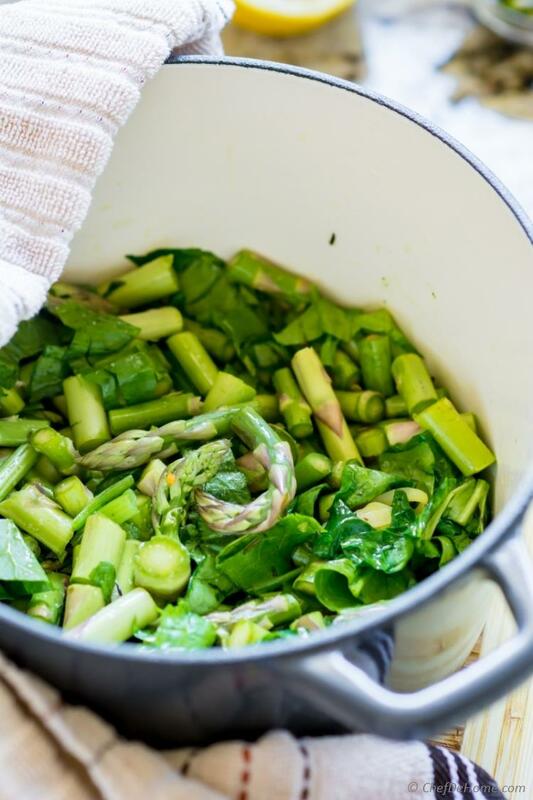 Asparagus is must-have in month of April! Even though we see it for many months during spring-summer season... March-April crop is so plum, fresh, and sweet. It is very important to cook asparagus properly. Just like green beans, too long cooking will make'em pale and mushy. However, when used in soups.. it will be okay to cook'em a little more. Yes, the soup color will not be as green but taste will be amazing. Actually, if you just starting to use asparagus in cooking? I would say, start with an easy soup such as this one. Asparagus is a little expensive vegetable. So, soup will be a perfect way to not worry about wastage and make a delicious seasonal vegetable dinner. Did I say, this soup fly from kitchen to dinner Table? ...and vegetable stock diluted with some water. Boiling all ingredients for 10 minutes (fresh asparagus takes 7-10 minutes to get tender) enhance the flavor of soup, and it is ready to puree. That's it! Soup is ready to serve! Was it fast or waHt? 1) I was after the nutrients of asparagus and spinach... So, I decided to cook both together with homemade vegetable stock. The addition of homemade stock even adds to overall nutrition value of the soup. 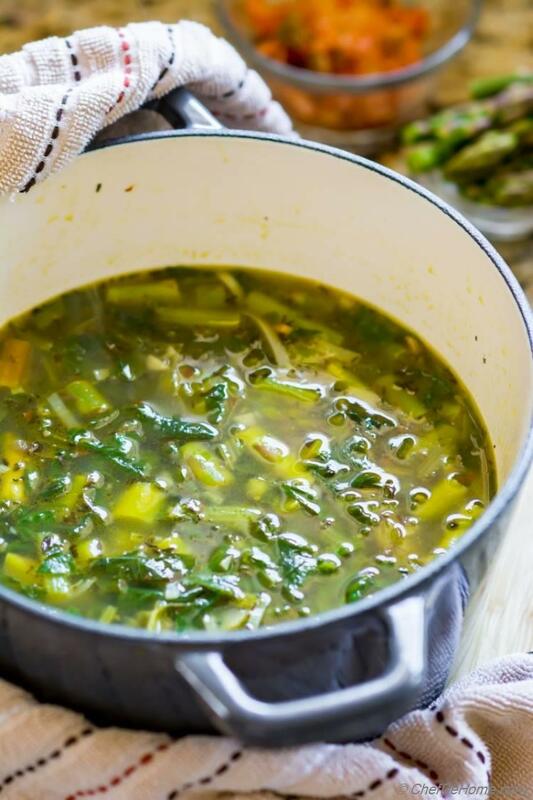 For more vibrant green soup, feel free to add spinach just before pureeing. 2) Also, due to acidity of lemon, cream-bases tend to curdle. I recommend adding coconut milk just before serving. Serve immediately is the key. 3) If you thinking: Kimchi, how is it vegan? Well, I found a brand recently which was vegetarian and vegan. So all those kimchi lovers, now you can eat vegan kimchi now! PS: I'm not paid or a spokesperson for this brand. Please use if you like. Asparagus soup is vegan with this kimchi or without. 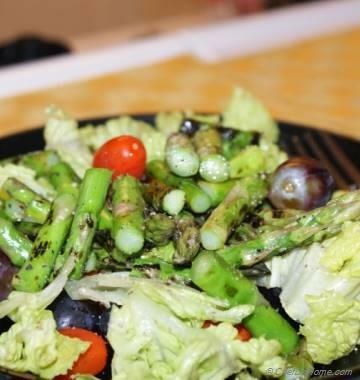 Friends, bring home some asparagus this weekend and invest in some healthy asparagus recipes. 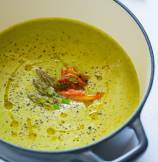 Make a batch of this creamy asparagus soup, add some to salads, saute with some chicken! Enjoy the veggie of season. Smart Swap Soup is pretty smart already! 1. Heat 1 tbsp of oil in a heavy bottom pot. Add chopped leeks, garlic, chili flakes, ginger, and thyme. On medium heat, saute until leeks are soft (4-5 minutes) Don't let garlic burn. 2. Add rough chopped asparagus with 1/4 tsp of salt and saute for 1 minute. Then add chopped spinach, 1 cup water and 4 cup vegetable stock. Bring to boil, reduce heat and cook for 8-10 minutes or until asparagus is soft. 3. 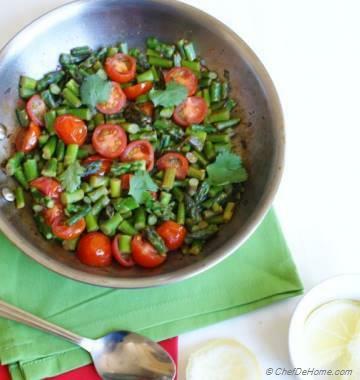 Add chopped cilantro, lemon juice. Using immersion blender or stand mixer, puree soup in 2-3 batches. Return soup to pot (heat on), add coconut milk and mix well. Taste and adjust salt (I added about 1/2 tsp salt). Add black pepper to taste. 4. Serve immediately with garnish of kimchi and asparagus shoots. Drizzle remaining olive oil and black pepper before serving (optional). Enjoy!